Today we honor an African woman born in 1869 who endured years of slavery under brutal inhuman conditions before being freed, and discovering an even greater freedom in following Jesus. She was called "Bakhita" by the Arab slave traders. It means "lucky one." There was nothing that looked lucky about the horrible abuse and mutilation that she suffered as a slave in Sudan. But then she was brought to Italy, where she worked in the household of an Italian diplomat and merchant and helped care for his daughter. Accompanying the girl to her convent school, Bakhita encountered the love of Christ among the Canossian sisters, gave her life to him, and was baptized Giuseppina Fortunata ("lucky one" in Latin). Though the diplomat's family treated her well, her position in Italy had not been legally clarified. An Italian court recognized her freedom, however, when she decided that she herself wanted to join the Canossian sisters. As a consecrated religious sister she worked for 50 years at the convent and among the people, simply but with profound charity and great joy. She not only forgave her enslavers and oppressors, but said she would kiss their hands if she saw them, because through their hands the Lord had brought her to Jesus. She died on February 8, 1947 and was canonized in the year 2000. 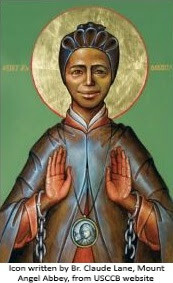 Saint Josephine Bakhita, you have a lot to pray for. We need your prayers especially in today's world. Pray for an end to racism, human trafficking, child abuse, and violence against women. Pray for South Sudan, your homeland. Pray for Africa and people everywhere of African heritage, especially those subjected to racial prejudice. Pray for people all over the world who have been driven from their homes by war, persecution, or inhuman living conditions. Pray for us, that we might love our enemies and and not seek vengeance against those who hurt us. Pray for us to be strengthened in the conviction that God loves us and them, that God has a plan, and that God orders everything to the good.